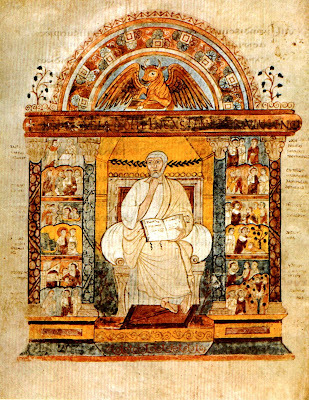 The St. Augustine Gospels (Cambridge, Corpus Christi College, Lib. MS. 286) is an illuminated Gospel Book which probably dates from the 6th century. It is traditionally considered to be one of the volumes brought by St. Augustine of Canterbury to England in 587. The book was probably given to St. Augustine by the Pope St. Gregory the First. "St Gregory the Great has often been called "the last of the Romans". Indeed, he had deep roots in the city of Rome, its people and its traditions. As Supreme Pontiff, he never lost sight of the Orbis Romanus. Not only did he take care of the part of the Roman Empire, Byzantium, that he knew well due to his long stay in Constantinople, but he extended his pastoral care to Spain, Gaul, Germany and Britain, all of which were then part of the Roman Empire. The great Pontiff's inner disposition is evident in the directions he carefully imparted to the Abbot Augustine, whom he sent to Britain: he explicitly asked him to respect the customs of those peoples, as long as they did not conflict with the Christian faith. Thus, Gregory the Great, in addition to fostering the missionary concern that was inherent in his ministry, made a crucial contribution to the harmonious integration of the various peoples of Western Christendom"